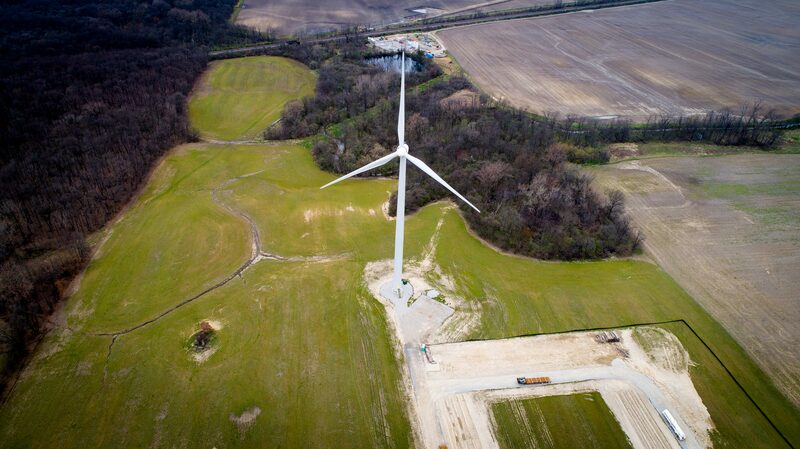 Delaware-based One Energy Enterprises LLC installed and operates this 1.5-megawatt distributed wind turbine that powers a petroleum pump station in Ohio. A technician services a 10-kilowatt wind turbine from Bergey WindPower of Norman, Okla.
Twenty-seven U.S. states are home to companies that manufacture various components for small wind turbines, which generate 100 kilowatts or less. RICHLAND, Wash. — Both businesses and homeowners are increasingly using distributed wind power thanks to innovative business models and other trends, according to a new report released today. The 2016 Distributed Wind Market Report offers the fifth annual analysis of distributed wind power, which largely involves generating wind power near where it will be used instead of purchasing it from large, centralized wind farms. 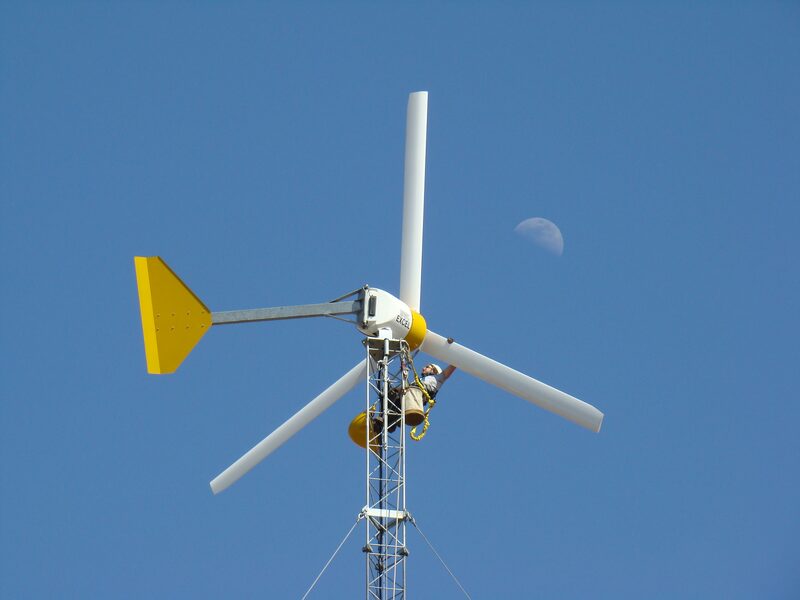 Distributed wind can range from a small, solitary turbine at a remote cabin to several large turbines powering an entire neighborhood. Third-party financing and leasing options are enabling companies and individuals to generate wind power on their properties. These options provide flexibility that eases the financial and logistical burdens of installing and operating wind turbines. Two examples are New York-based United Wind, which offers leases to farmers and others to install wind turbines on their land with little to no upfront costs, and Ohio's One Energy Enterprises LLC, which offers power purchase agreements so industrial companies can install large turbines at their facilities. Both secured significant financing in 2016, the report notes. "New financing options helped rooftop solar become widespread," said the report's lead author, Alice Orrell, an energy analyst at the Department of Energy's Pacific Northwest National Laboratory. "Now they could also help make distributed wind more commonplace and expand its role in the national energy mix." The average levelized cost of energy produced by distributed wind projects installed in 2016 ranged from 5 to 24 cents per kilowatt-hour, with power produced by larger turbines costing the least. In comparison, the average residential power rates in the U.S. range from 9.3 to 20 cents per kilowatt-hour while average commercial power rates range 7.5 to 15 cents per kilowatt-hour. The nation's cumulative distributed wind power capacity is about 1 percent of all U.S. wind power capacity, or enough to power roughly 265,000 typical U.S. homes annually. 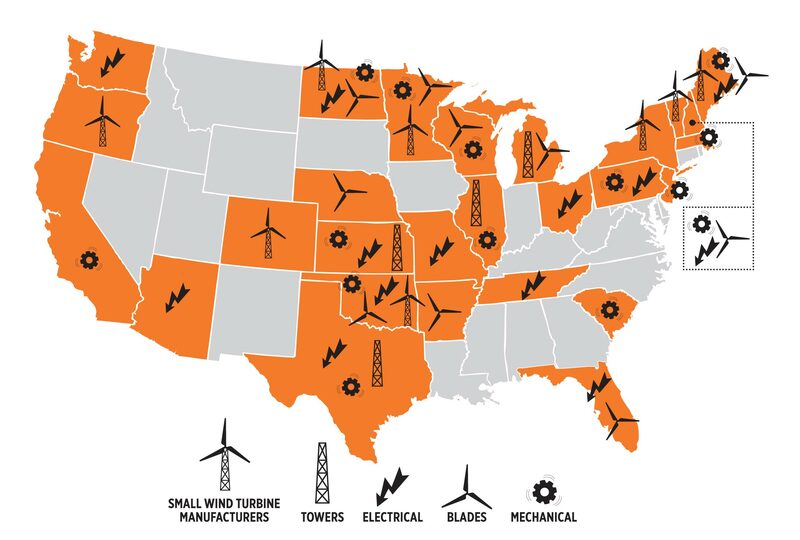 27 states are home to companies that manufacture various components for small wind turbines, which generate 100 kilowatts or less. Six U.S. manufacturers exported 10.3 megawatts in small wind turbines with an estimated value of $62 million. 45.4 megawatts of distributed wind power was added in 25 U.S. states and the U.S. territory of Guam in 2016. The nation has added a total 992 megawatts of distributed wind in all 50 states, Puerto Rico, Guam and the U.S. Virgin Islands between 2003 and 2016. Rhode Island led the nation by installing 15 megawatts of new distributed wind power capacity in 2016. Institutional customers — such as utilities, churches and schools — accounted for 29 megawatts of the new distributed wind power installed in 2016. 2.4 megawatts of small wind power was added in at least 22 states in 2016. The U.S. has added a total of 146 megawatts of small wind power between 2003 and 2016. New York led the nation by installing a quarter, or 627 kilowatts, of new small wind power capacity in 2016. For more information about the distributed wind report, as well as its companion reports on traditional utility-scale and offshore wind power, see today's announcement from DOE. And, for more information about PNNL's wind power research, visit PNNL's wind website. This report was supported by DOE's Office of Energy Efficiency and Renewable Energy.